Music is a vibrant part of the school, with numerous opportunities for children to get involved both on a regular basis and for specific events or productions. In the Senior School, we aim to develop pupils into confident musicians through performing in one of the many groups on offer, including Choir, String group, Brass group, Wind Band, Ukulele club and Rock Bands. The Senior Choir plays an important role in Chapel, singing on occasions such as Remembrance, Christmas, Easter and the final Valedictory Service at the end of the school year. Junior and Senior Concerts are held regularly and our annual Senior House Music Competition not only showcases individual talent but also allows all students to perform in their House Choir – led by Sixth Form students and extremely competitive! In Drama, the School puts on a fully-staged musical every two years. In 2017, our production of ‘Oliver’ featured children from Years 3 to 13 and, in Spring Term 2019, we will be staging ‘Grease’. 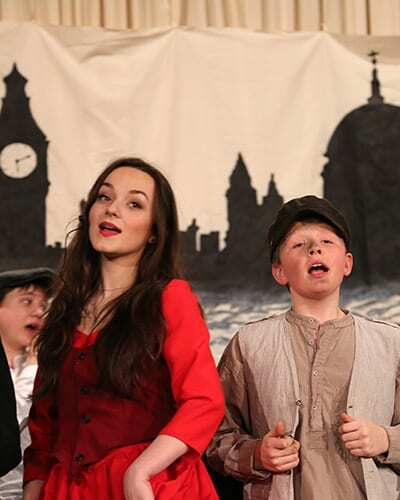 Productions for other parts of the School are also staged, the most recent being ‘The Lion, the Witch and the Wardrobe’, which involved pupils from Years 7 to 9. Pupils are also taken to concert and theatre trips in order to experience live music and drama. Recent highlights including Nicola Benedetti at Leeds Town Hall, ‘The Lion King’ in Manchester, ‘Billy Elliot’ in Bradford, ‘Stomp’ in Sheffield and ‘Wicked’ in London.